Home » Greenroom » Working in the Kitchen – How Safe Is It? Working in the Kitchen – How Safe Is It? Given the fast paced environment, long hours, heavy lifting, open flames, slippery floors and sharp objects is it not any wonder that the kitchen is a far more dangerous workplace than your average office cubicle. Most chefs can recall gruesome stories involving missing fingertips or disfiguring burns. As an industry professional, it is important to understand the cost and consequences of these incidents but more importantly we should all learn how they can be prevented. At Kitchen Coster, we’re working hard to create the best kitchen management software we can. As we’ve traveled across Australia meeting chefs, food delivery managers and owners it’s become as clear as day that reducing accidents and injuries is a top priority. In Australia, compensation for injuries exceeds $553 million dollars annually and the average time an employee takes off work due to an injury is four weeks. A good manager will do whatever it takes to prevent accidents from happening in the first place. During the 2012-2013 fiscal year Safework Australia reported that 8.9 out of every 1000 hotel and restaurant employees filed a workers compensation claim, totaling 117,815 cases (men were 9.6% more likely to file a claim than women). Despite these alarming figures, it does seem that Australia’s regulatory oversight and industry culture is doing something right. In the United States, a restaurant or hotel employee is 4.3 times more likely to file a claim than an equivalent worker in Australia. In New Zealand, they are 10 times more likely. Even though Australia is doing well there is still room for improvement. Since 2000, workers compensation claims in Australia have dropped 24% across the board, but restaurant accidents have only dropped 17%, less than almost any other industry. If you compare the incidence of injury to other industries per 1000 employees, the prevalence is a little below average. If these numbers are analysed from the perspective of injuries per million hours worked, suddenly the number of injuries is 7% higher than average. When employees work longer hours, their likelihood of injury increases. Perhaps the most critical aspect in preventing accidents is to ensure employees are reasonably scheduled to prevent fatigue from overwork. Long hours and infrequent breaks have always been the norm for the restaurant industry. Chefs often take pride in their ability to work long shifts with little more than a quick breather during which they all but inhale a hastily made sandwich over a garbage can by the dish station. As an industry, we respect and encourage this type of work ethic. In other occupations, such as medicine and truck driving, legislation has been enacted to limit the number of hours one can work in order to prevent mistakes. Just as in these fields, mistakes can be dangerous to restaurant employees and expensive for business owners. In a professional kitchen, attentiveness is the key to avoiding disaster. Just a momentary lapse in concentration while dicing an onion can mean a deep cut in a finger that requires stitches. A distracted cook might spill hot grease all over his foot while cleaning the fryer, causing a deep burn and infection that will leave him on his couch for weeks and cost the restaurant owner thousands. Boxes of produce often exceed 25 kilograms, and a tired employee is much less likely to lift properly and take care while handling it. Back injuries are among the most costly and difficult to cure, requiring the most time off to heal. Reasonable scheduling and the allowance of sufficient breaks increases your staff’s ability to concentrate on their environment and prevent accidents from happening in the first place. Proper equipment and work attire are also absolute necessities when it comes to preventing workplace injury in the kitchen. A loose pot handle can come off at the wrong moment and cause a disastrous burn. Appliances that are not properly maintained can cause explosions and fires. 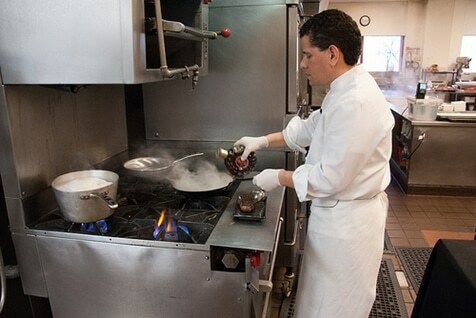 Chefs’ clothing is designed to cover exposed skin and to be resistant to heat and flames. Often these days you see chefs on television and in magazines wearing blue jeans and short-sleeved shirts and cooks in restaurants around the world are beginning to mimic this trend. Sure, it is great for showing off their tattoos but in the real world, it is important that business owners enforce a proper dress code in order to protect their employees from injury and themselves from liability. A professional kitchen is a place full of hazards. Momentary lapses in attention, poor equipment and improper attire can mean disaster! Accidents cost Australian business owners more than a half billion dollars each year in workers compensation claims. Many of these injuries can, however, be prevented. Owners are also prudent to ensure that all equipment is frequently inspected and that proper maintenance is performed when needed. This time and money are well spent as it is much less expensive than dealing with it after the fact and goes a long way in creating a safe environment in the food service industry in Australia. Alsco would like to thank Sam Howley of Canberra Australia, Co-Founder, Lead Developer of Kitchen Coster for sharing this important and very informative article. This will educate and remind all business owners and staff how important safety is. Working hard means earn more than usual – but we need to keep in mind everyone’s safety! Understanding the importance of safety is very important, this will keep our job and business at the same time. Alsco provides the best services to keep your organisation, company, small business or club safe. Know more of our Alsco Catering Workwear – where a chef or kitchen employee can still look and feel professional. Call now 1300 659 892!